It is possible to design & build the production model of the BLF lantern using the exact same body-center section, bottom PCB & springs, and a slightly modifived version of the tail cap as on the Q8 to help save some costs in new machining and parts. Most all those predictions with the ideas are good. even if this lantern is sold for $50 ~ 60 That is an great price for a quality lantern with the capabilities this will have compared to the many large, all-plastic, bulky, cold-tinted and badly designed lanterns on the market in stores or online in that price range. Even the best lanterns in the $80 to $100 dollar range i have & tested don’t come close to what the Prototype does right now. DBSAR, I just wanted to say thanks for doing what you’re doing. I’m very much looking forward to it. That was kind of my thought that the head was the most significant and costly part of the lantern. I can definitely see a modified tail cap with perhaps a hook on the bottom to allow hanging it from a limb, etc. In any case it was just a passing thought and I wouldn’t expect the body to add more than $10 – $15 to the lantern (just a guess of course). The ability to swap heads would allow some flexibility when taking the Q8 into the outdoors since only a single light would be needed. But then again it’s not that much more effort to take a Q8 and a lantern than a Q8 and a large lantern head. 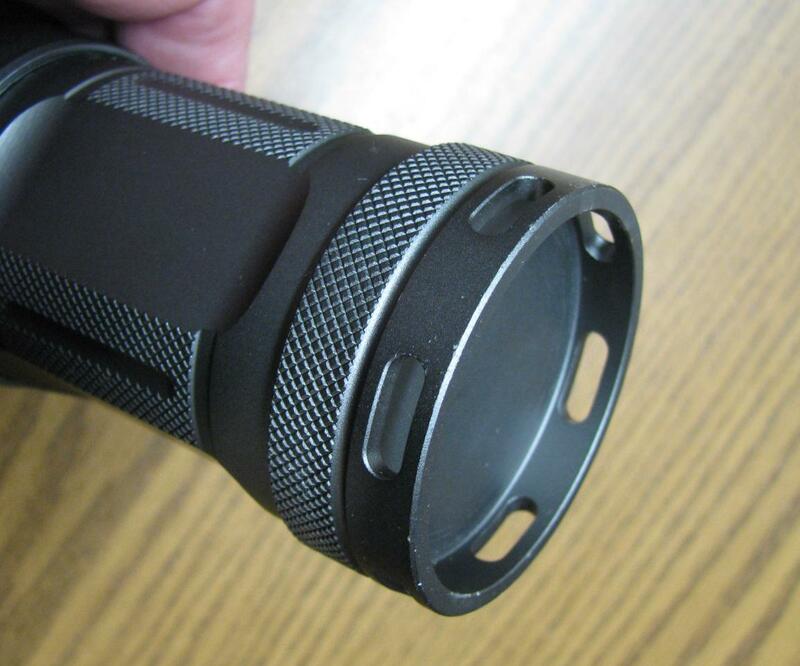 The tail cap on this 4-cell flashlight almost threads onto the bottom of the lantern prototype. I really like this design, as it is very stable as a base, has lots of slots for a bottom lanyard, and is thick enough to add a tripod-mount hole in the center. its not only me, we now have a team working on this. It got started as a project to design & build a lantern that works better than any store-bought lantern i have used & seen on the market so far, and to be able to offer a tested design as a production model with the help of some great people here on BLF. That tail cap looks great for a lantern. As you said a stable base and the ability to hang lots of lanyards from it. Hi, I’m interested, please add me to the list! Thanks! Well, it certainly is promising to hear that there is now a team working on this. My sincerest compliments to the team! Nonetheless, special thanks to you for vision and motivation. I’m not in this team but can I do a suggestion? Use 3 18650’s parallel instead of 4 (and thus leave legoing with the Q8). This makes me think, probably impractical, but how about using one slot of the battery tube from the Q8 for the USB charging/powerbank function. That way if you buy the lantern, you have the option of converting your Q8 into a 3 cell with USB charging/powerbank. Will be to difficult to design the driver base contact plate, (adding to the cost & complexity, and require 2 charger circuits, & a complex set up for battery configuration. Also the capacity of a single 18650 charging power bank is almost useless for thew newer larger phones like an iphone 8 or Galaxy 8 , and a 3-cell set up for the lantern will just lower total run times and form the lights i seen the size reduction is not even worth the redesign for a complete new body when we already have a great body design with the Q8. A four 18650 in parallel set up like the Q8 is the only practical way for best performance overall to power both the lantern & a power bank option. You must not over-estimate the effort of designing body parts for the manufacturer, that is thinking for them, what they are and are not prepared to make they are perfectly capable of deciding themselves. For the Q8, we went with an existing Thorfire battery tube which IMO does not really fit the head in a design point of view, which I still think is a bit of a pity (and looking at the picture in post #670, that would have been a nicer and more practical tail end). And thinking back, that was not because of cost and complexity but because we were uncertain of the dedication of Thorfire to the project and wanted to make them feel comfortable by using a part of their own design (a thing that should not be needed anymore, now that the Q8 project has proven to be succesful). By the way, why is there a need for a tripod mount on a lantern? If you make a nice lanyard hole on the bottom, you can delete the threaded holes IMO. A hook on the head would be nice, I don’t have a need for it on the bottom. why is there a need for a tripod mount on a lantern? If you happen to have a tripod it allows you to not only raise it, so that the table (for e.g.) it is on does not cast a shadow everywhere, but it also allows you to tilt it to cast a shadow behind so you can more effectively light things to one side and have no glare on the other. Also it allows you to raise it above eye level on a table so it is not blinding everyone sitting there, when you don’t have a tree or something to hang it from. And if the tripod mount is central it allows for mounting a ring to hang it from that is central, so if it spins there is no distracting shifting of the light pattern. Worth having, especially if you are taking a Q8 and/or a camera with you as well, so everything is compatible and more options are opened up. I haven’t actually had time to fully read through the thread but I have always wanted a good lantern so please add me to the interest list for one. I thought I already expressed my interest but I’m not on the list yet, so put me down as interested please. I am interested, please add me to the list with 2 pcs. The advantage of a tripod mount on the bottom is to be able to mount the light on a tripod, to illuminate a larger open area, ( like a camping field or parking lot.) i may make a demo photo soon of that idea. Please put me down for 3 more. Thanks! Glad to see this project is making progress. Can’t wait to see the final product. Thanks for the info on the tripod holes guys. I usually have a can of beer or a log around while camping, guess that’ll do in most cases to raise the light. But more options for more uses is always good. Looking forward to the pics DBSAR! Sounds like a great little lantern Count me in! Could you add me to the interest list again (for a total of 3 times)? Thanks.. I am already on the list for two, I excited to see the finished product. That said, I do a lot of backpack camping where packing in a two pound lantern is a bit much. I am thinking about swapping leds on a single 18350 or 18650 light for times when I can get by with a smaller lantern. I might even get crazy and try to mod it with a down facing LED like you are doing. It is always fun to follow these projects through the twist’s and turns. I am already thinking about what the next project might be. Keep it up guys! I think the idea is to integrate the charging circuit into the tube in some way. It could have a spring at the top to contact the positive ring on the driver, the same as the cells, and the negative side can come directly from the grounding of the tube itself. When the light is assembled with cells inside, the charger/power bank would be parallel to the three cells. The USB port(s) can be slotted through the side of the battery tube. If done right, the tube can be legoed with a Q8, removing a “cell” chamber (compared to the Q8 tube with four cells) and replacing it with a “charger” chamber in-built in the lantern’s battery tube. Interesting night earlier with story. We have a power failure at around 6 pm and has been out most of the night until now. Instead of running to the garage to start up the noisy generator, the first lantern of choice ( out of dozens of lanterns i have) is the prototype BLF Lantern. 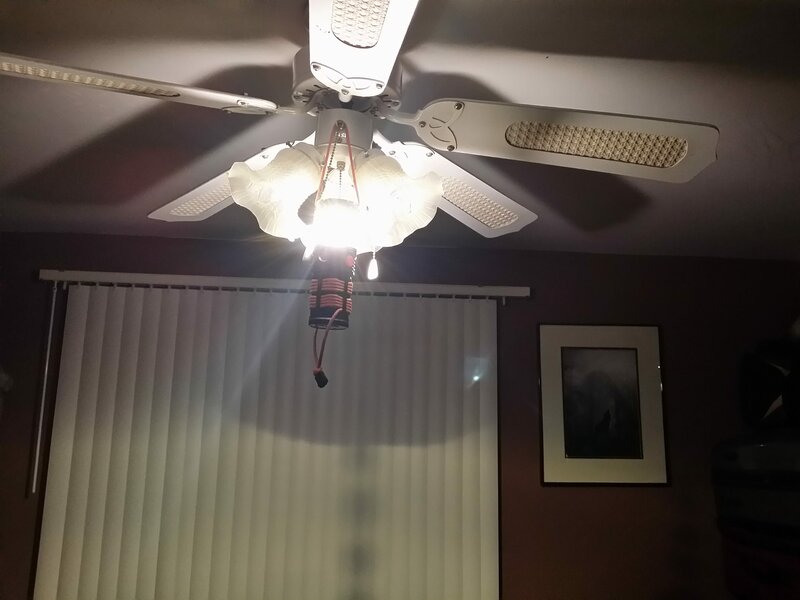 I hung it on the dining room ceiling fan to light up the whole room, (on high mode) My neighbor & his wife from across the street was visiting for dinner, & they were fascinated with the lantern. From out side through the window it looked like we have the ceiling light on as normal. My neighbor asked where he could buy 8 or 10 of them for their cottage when they have their beach parties, I told them it does not exist yet as a production model, and had to explain to him the whole BLF project from start to finish. He even wanted to buy the prototype, as he said its compact size, output, color tint, and practicality with the built in charger puts all his other battery operated lanterns to shame. Basically we have interested buyers now from outside the BLF forum, indicating how this lantern could be a big hit with the general public, camping groups, cottagers, and remote locations without power. So we all enjoyed our dinner cooked on a propane stove with the BLF prototype lantern lighting the room until the power came back on 5 hours later. I would like to be added to the interested list.